Requirements: Any Atari computer with at least 48K RAM and a disk drive. Part of SynTrend also requires Atari BASIC. It was a year and a half ago that Synapse announced the Syn Series of software at the June 1983 Summer Consumer Electronics Show (CES). This very ambitious collection of software was going to include programs for word processing, data base management, spreadsheets, telecommunications, stock charting, graphics, and calendar-keeping. All of the programs were going to use similar file structures so they could share data. Prototypes of several of the programs were shown, and they looked easy to use and full of features. By January 1984, at the Winter CES in Las Vegas, Synapse had struck a deal with Atari for the three major programs in the series. SynCalc, SynTrend, and SynFile+ would be produced by Synapse and marketed exclusively by Atari. The word processor, SynText, was canceled to keep it from competing with Atari's AtariWriter, and Synapse was free to market the remainder of the Syn Series on its own. After a long wait, the spreadsheet, graphics, and data base programs are finally available. As promised, SynCalc, SynTrend, and SynFile+ can share the same data files. 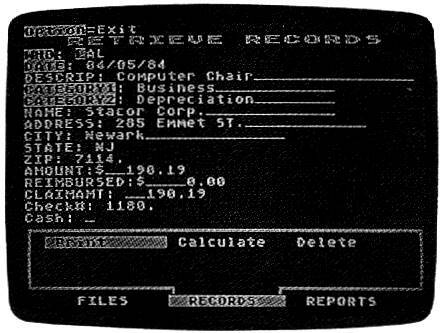 Also, the three application programs are compatible with AtariWriter so that data can be embedded within reports and cosmetically formatted. However, in the wake of Jack Tramiel's purchase of Atari, Synapse will be distributing the entire Syn Series after all. Let's take a closer look at these programs' strengths and weaknesses. SynFile+ is an outgrowth of two previous Synapse data base programs. The original one, FileManager 800, has been around for several years. It was fairly easy to use but lacked sophisticated features such as field totaling. This problem was addressed by the improved program, FileManager+, which became quite popular. SynFile+ shares many features with the earlier programs, but has been totally rewritten in Forth, resulting in faster sorting and record access. Also, it uses the full 48K of memory to add significant features (the new XL computers have 64K, but Synapse apparently wanted to keep the program compatible with older Ataris as well). SynFile+ is totally menu-driven and memory-resident. It is very easy to use and does not require you to swap disks when accessing different functions of the program. One of the more useful new features is that your data file disk can be formatted in any of three disk densities: single density, Atari 1050 enhanced density, and true double density. Choosing enhanced or double density allows you to store more records on the disk than allowed by previous versions of the program. You can store your data on up to 16 disks-a lot of capacity, but also a lot of swapping. There are other new and useful features in SynFile+. Mailing labels can now be printed from one to four labels across. When setting up labels or reports, the screen can be scrolled horizontally up to 232 characters. The print format line is a template for specifying the horizontal layout of your report. The location of field names under the print format line determines how the columns will be placed horizontally. You can use up to 40 field names. Another worthwhile feature of SynFile+ is that it can read and write data files in DIF (data interchange format). This lets you pass your data base information to such programs as SynCalc, SynTrend, and VisiCalc. Also, you can bring DIF data into SynFile+. In addition, when creating a report or mailing list, you can direct the output to the screen, printer, or a text file on disk. This text file has a .TXT name extension and can be accessed by AtariWriter. SynFile+ contains quite a few new field types. In addition to the usual text, numeric, computed, and dollar fields, conditional and table lookup fields are allowed. Conditional fields contain a code that is crossreferenced to a text entry. Based upon the value of a previously specified relationship, one of several text entries will be printed in your report. Similarly, table lookup fields contain a code that is cross-referenced to a list of previously defined alternatives. At report time, the matching table entry is printed instead of the particular code. Other new field types include record numbers initially assigned and incremented by the computer, counters (similar to record numbers except you specify the starting value and the increment), and the date. Once a date has been entered, it will automatically appear on succeeding records so you don't have to enter it for each record. A handy feature. Retrieving a record with Synapse Software's SynFile+. SynFile+ comes with a program disk, a tutorial disk, and a 121-page attractively packaged manual. The tutorial disk is a clearly presented, step-by-step introduction to all aspects of the program. The manual is wellwritten and contains such useful features as a quick reference card, glossary, and index. SynFile+ does have some inadequacies, though. First, it cannot read previously created FileManager 800 and FileManager+ files. If you're converting to SynFile+, you have to retype all of the data into the new program. Fortunately, Synapse is working on a utility that will convert the older format files into SynFile+ format and also provide backups. It's expected to be available late this year. Another weakness is that SynFile+ has no report-writer function to let you generate multiple sublevels in a report, each with its own subtotal. Again, Synapse promises a utility/enhancement disk by the end of the year with a sophisticated report generator. These few complaints aside, SynFile+ is an excellent data base program for the Atari computer. Its compatibility with the other Syn series software, ease of use, and number of new features make it definitely worthy of consideration for Atari users seeking a quality data base manager. SynFile+ also works automatically with the Axlon 128K Rampower and Mosaic 64K Select boards. Of the three Syn Series programs reviewed here, SynCalc is clearly the best, offering excellent features and the best value. Compared to the existing spreadsheet programs for the Atari computer, SynCalc simply cannot be matched. SynCalc lets you create various worksheets of text and data for such applications as income taxes, budgets, checkbook balancing, forecasting, and preparing tables. The spreadsheet itself is a grid of 255 rows and 128 columns, forming over 32,000 cells for entering data. Each cell can contain text, numbers, or a formula. As numbers are entered, results are recalculated and displayed instantly. Text and data can be easily manipulated throughout the grid. Formulas, numbers, and labels can be copied from one position to other positions. Two parts of the spreadsheet can be viewed simultaneously by using the vertical and horizontal splitscreen feature. What makes SynCalc especially attractive is its ease of use. Pop-up menus display the current mode and available functions. With experience, you can eventually issue direct commands without referring to the menus. When using the menus, the commands are always displayed at the top of the screen. For example, to copy cells A1 through A5 to locations B1 through B5, you'd have to select a total of six menu entries. Alternatively, you can type /C A1:A5 B1:B5. You can type cell addresses directly or move the cursor to a cell and press RETURN. 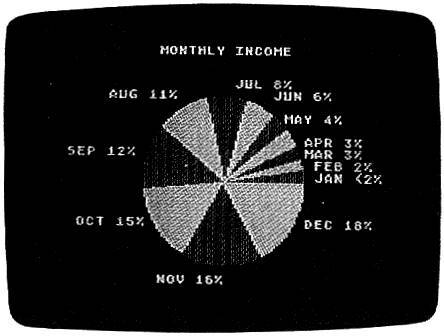 There are several features unique to this spreadsheet program for the Atari computer. Variable-width columns let you format and display your worksheet more flexibly. If a particular cell's contents exceed the width of the column, you can still display the entire entry. This text overflow feature may be turned off if desired. Cells can be justified left, right, or centered. If you change column widths, the justifications are automatically readjusted. Numeric cells can be displayed in a variety of formats: Fixed-point, floating-point, engineering, and scientific notation, each with up to ten decimal places displayed. A leading dollar sign can be added and commas inserted to make large numbers more readable. There are just too many format options to describe here. A very powerful feature of SynCalc is the ability to sort data entries in alphabetic or numeric order. Sorts can be either ascending or descending. Once you define the block of cells to be sorted, you specify a column for sorting and the upper-left cell of the destination block. Although SynCalc can sort on only one column, you can perform multiple sorts by repeating the process. SynCalc also lets you use one- or two-drive systems; select menus and filenames by pressing just the cursor key (without the CONTROL key); and perform table lookups, conditional tests, and statistical functions. Also, you can format disks from the main menu and save worksheets in either DIF format (for use with SynFile+ and SynTrend) or text format (for use with AtariWriter). I've used the AtariWriter output feature many times and think it is one of the best features of SynCalc. The 148-page manual is divided into introductory, tutorial, reference, and index sections. Screen shots help clarify examples, and a quick-reference card is included. Syncalc is an excellent product. It has many more features than VisiCalc and is much easier to use. 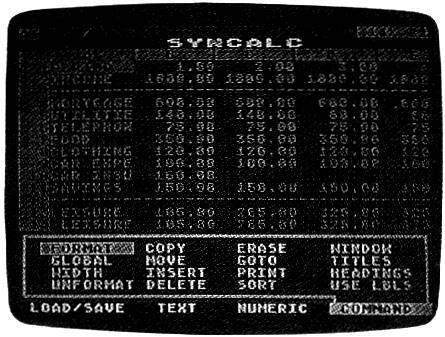 The ability to access VisiCalc files and to integrate with the other Syn products and AtariWriter makes SynCalc a "must-have" program for nearly everybody. Once you start using the program, you'll find more uses for it than you expected. Setting up a home budget spreadsheet with SynCalc. SynTrend is actually composed of two separate programs, SynGraph and SynStat. SynGraph is a high-resolution, color-graphing program, and SynStat is a statistical program for analyzing trends in your data. The package comes with two program disks and a two-section manual. SynGraph can be used to create four different types of graphs: line plot, bar chart, scatter plot, and pie chart. It will accept data in SynStat, SynFile+, SynCalc, and VisiCalc file formats. Once generated, graphs can be saved to a disk and printed. SynGraph requires BASIC and works with either one or two disk drives. Working with the program is essentially a two-step process. First, you compile the data files that will be used to create the graphs. Second, you choose the type of graph to make. The line graph, scatter plot, and bar chart can each display up to three different factors (sets of data). Each factor must exist in a separate data file. The pie chart is created from a single data file, and compares the data points against others within the same file. You can choose labels for titles, X-Y axes, factor names, and pie chart slices. X-Y coordinates may be displayed in either whole numbers or decimals. Specific scales can be entered for all but the pie charts. When displaying line and scatter plots, autoscaling results in numbers in integer format and divisions of 5 and 10 for X and Y, respectively. Autoscaled bar graphs yield decimal format numbers, Y divisions of 10, and a cluster pattern. A cluster pattern places the factors (a maximum of three) next to each other along the X axis, whereas a stacked pattern places the factors atop each other. Any of the graphs can be rescaled at any time. Pie charts may contain up to 12 slices and are used for graphing one factor. Each slice is labeled (up to seven characters) with its percentage of the whole. If you don't name the slices, the program defaults to labeling them A, B, C, etc. The strengths of SynGraph are the ease of entering and editing the data and creating the graphs, and the straightforward documentation. Also, the ability to save graphs for future use and a slide-show program that can recall the saved graphs in sequence are useful features. Unfortunately, SynGraph has a few weaknesses. Files cannot be deleted, renamed, or catalogued without exiting to DOS. The only printers it supports are those from Epson, NEC, and C. Itoh. There is no support for Okidata printers, and problems have been reported using the C. Itoh 8510 Prowriter. Synapse is aware of these problems and is working on a fix. And finally, the program requires the BASIC cartridge but does not alert users of the older 800 and upgraded 400 computers if they forget to plug it in. Overall, SynGraph is a usable program for graphing data, assuming you have a compatible printer. Its ability to access SynCalc, SynFile+, and VisiCalc data make it more than just another graphics program. SynStat is a completely menu-driven program for manipulating and analyzing data. You have a choice of descriptive analysis, or simple or multiple regression analysis. Up to four disk drives may be used. Since SynStat can read or write DIF format files, you can analyze VisiCalc data and use VisiCalc to read files created with the SynStat data editor. Also, you can format disks directly from the main menu without going to DOS. The data editor contains several useful commands for transforming columns. Data in one column may be added to data in a second column, with the results appearing in a third column. Likewise, columns of data may be subtracted, multiplied, or divided and the results placed in a third column. You can add or multiply columns by a constant, with the results replacing the original numbers. The natural logarithm of a column of data can also be obtained. SynStat's descriptive analysis displays eight pieces of information: The number of observations, minimum and maximum values, the range of values, the average, standard deviation, variance, and the standard error. Regression analysis is a common statistical technique to confirm or deny a hypothesis concerning the relationship between two or more variables. A separate file is used for the independent and dependent variables, and they must contain exactly the same number of observations. SynStat first displays a summary of the data. The coefficient and standard error of the estimate are given for each of the variables. It also displays an overall r-squared (coefficient of determination), adjusted rsquared, and standard error. A proportioned pie chart created with SynGraph. If you use two independent variables, SynStat displays a screen of partial correlation co efficients. This information is used to determine how closely the two independent variables are related to each other. The final screen is called the residual analysis screen. Here the actual, predicted, and residual values are shown for the data being analyzed. The documentation contains some tutorial information on regression analysis, but you should already be familiar with the topic before using the program. Any introductory statistics textbook should do. The SynStat manual contains a glossary and index in addition to its tutorial and reference section. Since SynStat is part of the SynTrend package, careful thought should be given to its usefulness in meeting your needs. As a whole, SynFile+, SynCalc, and SynTrend represent quality software for the Atari computer. Each has useful features, such as rapid cursor movement and straightforward menu screens, and is easy to use. Their ability to share data with each other and to work with AtariWriter are valuable assets. The only feature one might wish for is 80-column capability with the Bit-3 and Austin-Franklin 80-column boards. According to Synapse, there will be new versions of the programs that will work with Atari's 80-column board in the 1090XL expansion box, when or if the box is released. These programs have taken a long time to finally arrive, but the wait has been worth it.